If you've itching to put Star Trek Captains through your own missions, good news: Cryptic Studios has revealed it's planning to let you do just that. While RPGs these days often feature custom level/quest creation tools, such a feature isn't exactly common in MMOs. Cryptic Studios has announced that it's going to allow players to create their own missions in Star Trek Online from scratch, something the developer has done before with City of Heroes. 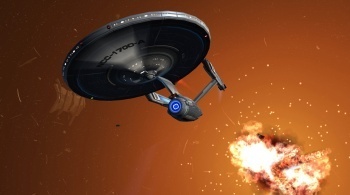 The developer has revealed that players can sign up to be a part of the beta test for the "Foundry" toolset, which will allow them to do just about everything the developers can; they'll be able to create mission objectives, characters, environments, all of which can be combined to create original Episodes in the game. Other players will then be able to play through this original content. Personally, I think this sounds pretty cool, since it seems like the next evolution of fan fiction for many Star Trek fans. I personally look forward to hearing about an Episode where Captains Kirk, Picard, Janeway, and Sisko wind up stuck in a time pocket (I'm sure Q will be involved, somehow) and it's up to you to save them all.